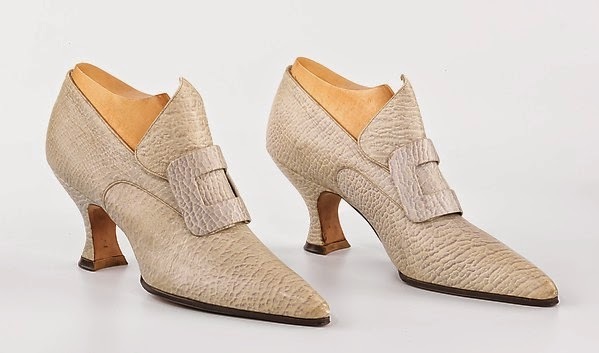 I find infinite interest in this pair of c. 1920s pumps and have wanted to write about them for some time. They are an excellent example of a "Colonial Revival" or "Georgian Revival" shoe. 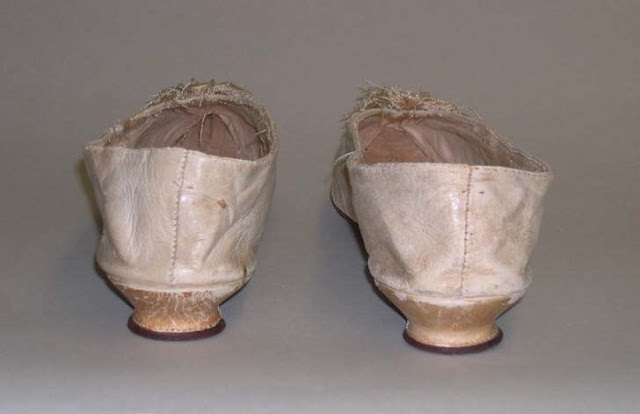 The leather pumps were of American manufacture by Charles Strohbeck, Inc. The oversize "Pilgrim" or Cromwell buckle is a main design feature, along with the crackled leather and pointy toe, all referring to the past but re-imagined for the 1920s woman. 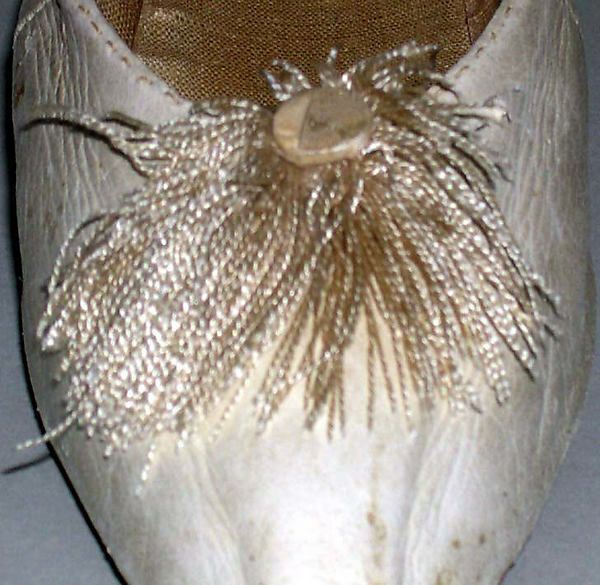 The high French or Louis heels also refer back to the Georgian period. Heck, I would wear them today! The Metropolitan Museum label notes that they were kept as samples by the company, perhaps indicative of the high style of the day, rather than what was actually worn. How many more wonderful textile related words can you squeeze into this title? Plaid. Silk. Taffeta. Boutis. Quilt. Each on its own denotes something special, but when taken together? It is beyond the ordinary, everyday. 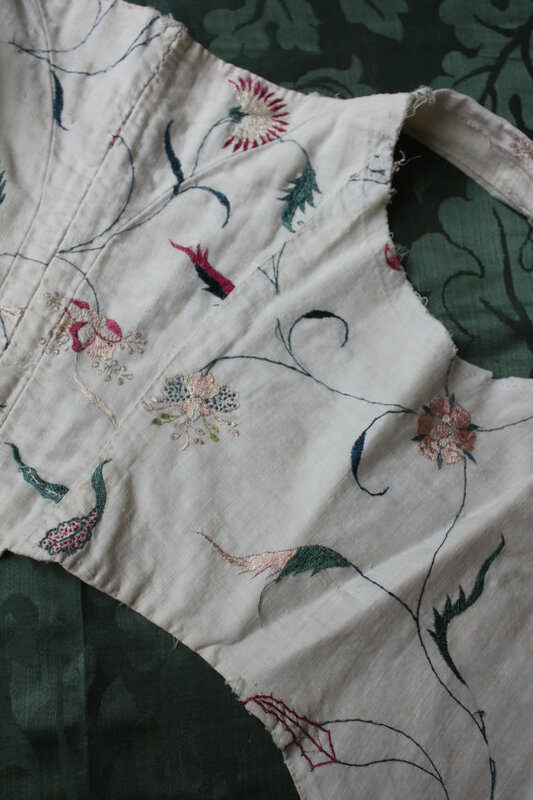 This cheerful French silk taffeta, most likely intended for a dress, was in circulation by 1764 --it appears in Selling Silks: A Merchant’s Sample Book by Leslie Ellis Miller. 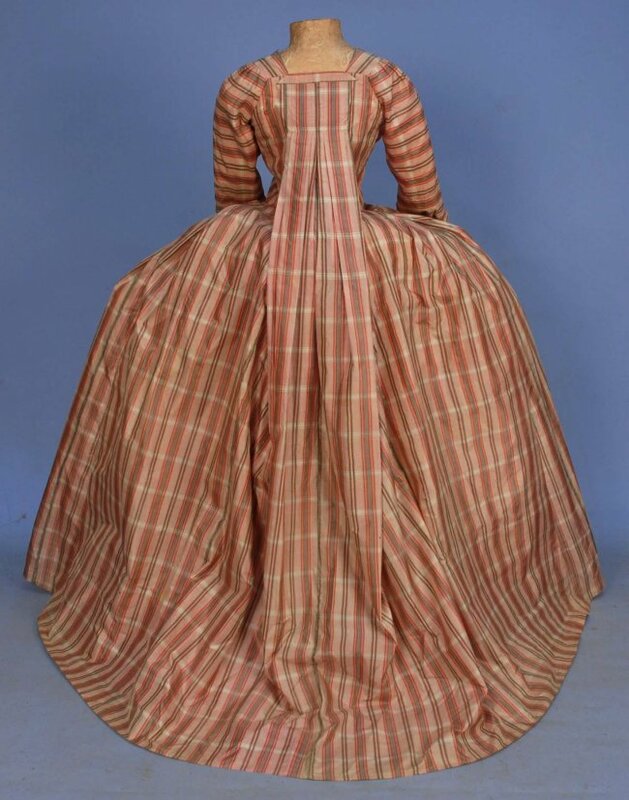 There is at least one extant example of a gown made from the same or very similar plaid, sold at Whitaker Auction. However, at some point -- probably a few decades later than the silk production date—it is transformed into a French quilt (c.1800?). 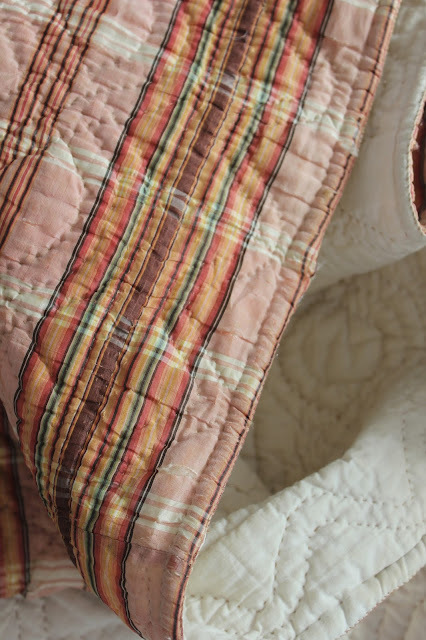 The quilting is of a type known as boutis. Boutis work is a Provençal word meaning 'stuffing', describing the manner in which two layers of fabric are quilted together with stuffing sandwiched between sections of the design, creating a raised effect. This example is charming, and includes hearts at the corners. You can see bits of the cotton wadding or batting used to “puff” out the quilt, typical of boutis work. Taffeta is a very thin silk. The batting used to quilt the boutis has pushed the silk, causing strain and resulting in damage. However, the design of the hand stitching also holds the silk together. Although damaged due to folds and wear, with tears to the boutis and shattered silk, it nonetheless is valuable as a study piece. 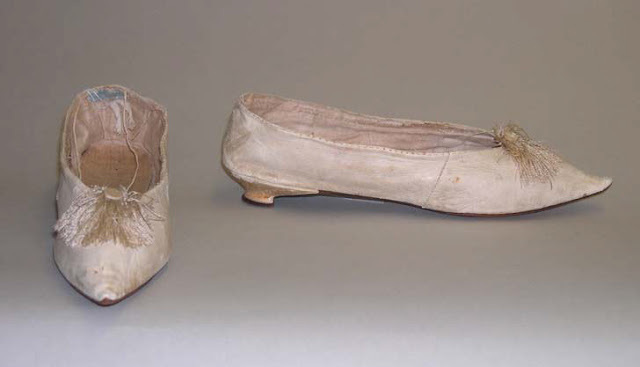 These delightful British wedding slippers (noted as such via the Metropolitan Museum) were made by “Soames, Ladies Shoe Maker, London.” They are typical of their day: leather slippers with a low heel and all the energy focused at the toe. A wonderful fringy silk tassel captures the eye and surely would have been noticed as one promenaded or danced across the floor. The work of Soames is similar to shoes by Bragg & Luckin, and Hoppe, both of Londan. Examples of their work survives at The Bostonian Society, the Royal Ontario Museum and the Smithsonian Institute to name just a few. The label indicates an increasing specialization between women’s and men’s shoes. “Soames” was most likely Nathaniel Soames, a shoemaker at 9 Ludgate. Soames was able to send his son, Henry (1785-1860) to St. Paul’s School. From there he matriculated to Oxford. He became an eccelsisatical historian. It appears another son, of the same name, continued in the family trade. While information on Soames may be somewhat spare, we get a sense of the challenges of doing business in the great metropolis in the 18th century. He shows up in the 1797 records of the Old Bailey – as the victim of one William Clark, who “feloniously stole” 18 pair of men's leather soles from him, valued at five shillings. The episode tells us a bit more about Soames shop. Clark was a workman, doing some work for the shoemaker. We learn that Soames had an apprentice or journeyman named John Dupree who testified that he was in his masters shop at the time of the theft. A second employee, named Richard, saw the property on the prisoner’s person as he came up from the cellar. Clark was fined one shilling and discharged. Scant records indicate that the family business continued and that Soames may have invested in other businesses or acquired property. All images are courtesy of the Metropolitan Museum. It was the exquisite, delicate silk thread embroidery which first caught my eye. Some of the threads have worn away and the penciled outline drawn to guide the stitching is faintly visible. 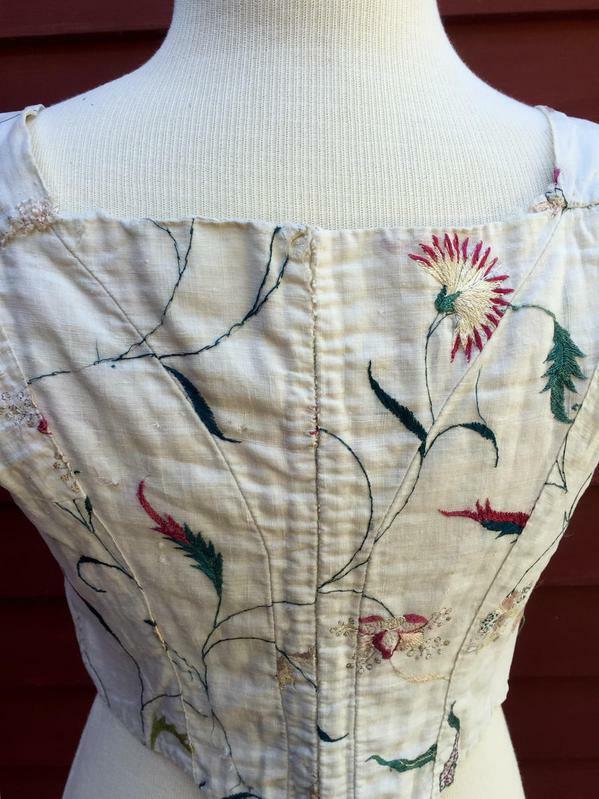 I know nothing about who embroidered this bodice or even where it was made. It was purchased in America, so perhaps it was made here during those turbulent mid-century decades. And yet the global nature of goods in the 18th century, does not necessarily support this attribution without a provenance. A single stay survives. 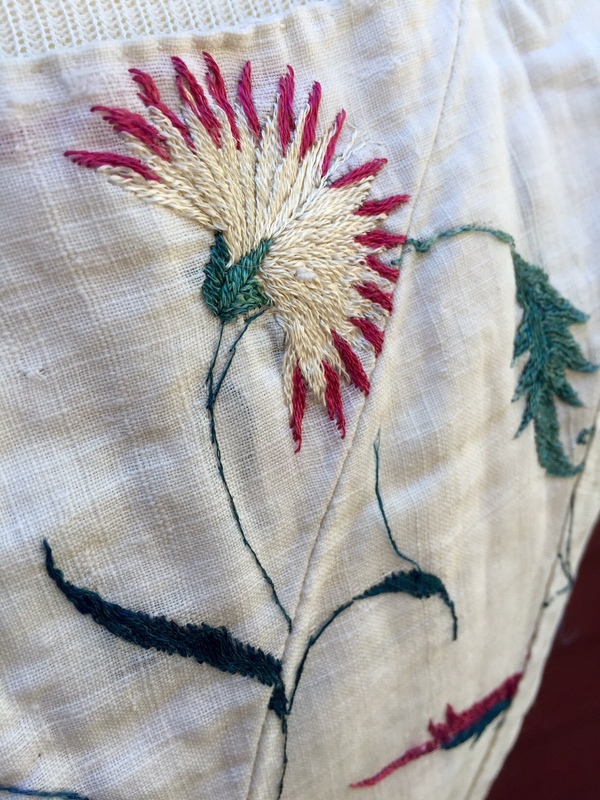 The hand embroidery features those familiar Jacobean flower and leaf motifs we find through much of the 18th century. The height is 13.5 inches, it is 14 inches across, and 20 inches from bodice edge to edge when open. While not considered a “museum quality” garment, I nonetheless find it interesting as a study piece, which I share with my museum studies and material culture students. Was it being remade for a younger member of a household? Was it in the process of being completely disassembled for some of its pieces to go into a new garment? While we may never know the answers, it serves as a good example of silk embroidery and a time when even the smallest pieces of textiles were used and reused and remade.